Scuba diving was one of those activities that I’d always wanted to try out, but for one reason or another (namely a deep-seated fear of the deep blue sea) I always found an excuse to keep putting it off. Well, the moment to take the plunge came during a family Christmas holiday on the beautiful island of Sri Lanka. On the actual day of the dive, a tinge of panic crept in, I literally had that “sinking feeling”. My fear of what might be lurking under the sea (namely fish with sharp teeth) started to play on my mind. To be honest, I wasn’t sure whether this dive was going to end up being a non-starter! Our qualified PADI Instructor (Mase) had very high standards and expected much of his colleagues who (back at the base) were responsible for maintaining and testing the scuba gear. If he wasn’t happy with a piece of the hired equipment he would issue instructions for it to be changed immediately! This was quite comforting. (In shallow waters) Mase provided our family group with an initial 25-minute learning session which covered the most important and basic information, we also practiced a couple of key skills and exercises to make us feel at ease with the scuba gear. Personalised instruction and guidance was provided according to each diver’s capability and competence. The instructor also covered some of the misnomers and misconceptions which we harboured, for instance one of our party was led to believe that you should rub spit into your mask to prevent it from fogging, instead the civilised way was to use a dab of baby shampoo, a much better and cleaner option. In addition, the thumbs up sign we all took as meaning “everything is okay”, in the depths of the water, giving a thumb’s up sign means that you have a problem! The hand signal denoting you were okay happened to be a totally different sign (on dry land however, this could be misconstrued as being rather offensive). 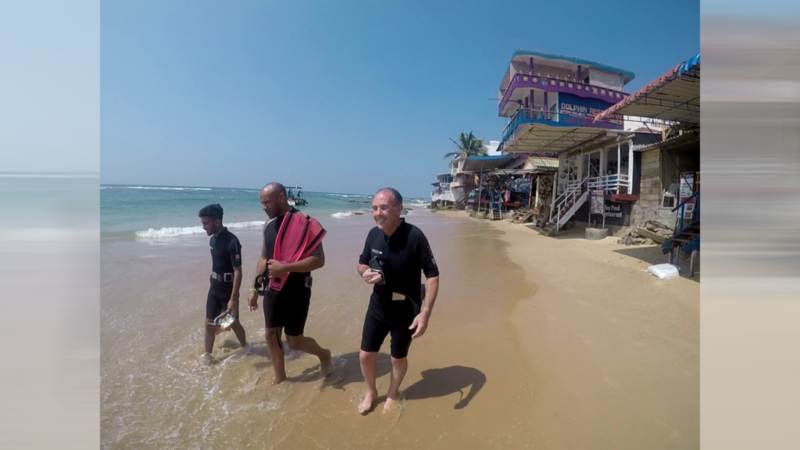 Darrel (pictured center) ready for his scuba dive in Sri Lanka. Whilst analysing my dive experience, and how I was empowered to achieve my goal, it reminds me of how organisations can be empowered to better achieve their Cyber Security goals. Today, technology changes at a rate most businesses find hard to keep pace with, and this is a problem for many IT Security professionals. What with Digital transformation, moving to the cloud, mobile working etc, organisations work more dynamically than they ever have done before. In a similar vein to my anxiety of the deep blue sea, IT security professionals are worried about the sea of cyber threats and risks that can result from this dynamic change. As I chose to prepare for my dive by employing the expertise of a fully qualified PADI diving school, many businesses choose to partner with Managed Service Security Providers (MSSPs) either for a fully managed security service, or as an extension of their internal security team. This type of relationship can deliver significant benefits. MSSP’s typically work within a number of different client environments and have close exposure to an array of (best in class) vendor technologies. My PADI instructor (Mase) ensured a high degree of clarity and comfort to me during my scuba dive. Similarly, MSSP provides a high degree of clarity and comfort to businesses who look to embrace new initiatives (especially ones that will give them a competitive edge). Guidance around security measures which safely allow employees to use the latest and greatest (software and devices) is a small part of the advisory services on offer. Armadillo Managed Services may not be PADI qualified, we are however ISO 27001 certified. Armadillo focus on enabling companies to conduct their business in confidence, without fear of security attack and without compromising how they operate. I’m pleased to say the dive went exceptionally well! Not only did I survive and live to tell the tale, but I thoroughly enjoyed the whole experience. I will certainly be up for another scuba dive next time! Written by: Darrel Ellis, Client Director at Armadillo.